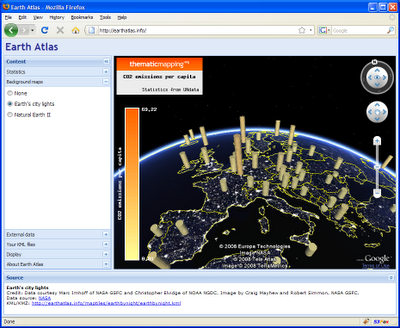 Earth Atlas is a prototype web application showing how KML files can be visualised directly in the web browser. The Google Earth API and the Ext JS library are used to create a responsive user interface. Earth Atlas contains KML files from the Thematic Mapping Engine, a few KML SuperOverlays as alternate background maps, and KML files from external sources. First release today - to be continued! 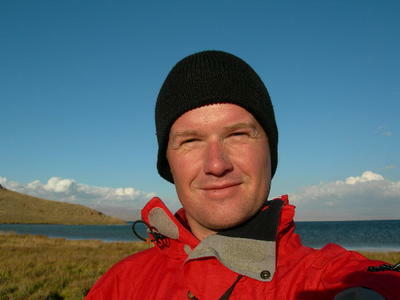 Another great one Bjørn! I like how you pulled it together and also simulated the Earth environment but not too much. One suggestion though, this looks best under 1400X1050 resolution, but for presentations, usually at 1024X768, the two screen overlay legends for much of the data overlap with each other. Are you planning to release this as GPL3, or are you sticking with the commercial ExtJS license? Gerardo: I agree that this would be a nice feature. Mano: I've now reduced the height of the title and source panels. Thanks Bjørn - a real eye-opener! Great stuff Bjorn. Really like the look and feel of it. Loe seeing the range of thematics you can make in the browser. Hopefully gets more people excited about what you can learn through good data visualization.